The easy to use three-axes plug-in TMCM-3230 module extends Trinamic’s OEM line. The evolution of technology is transforming all industries, including motion control. Following components that become increasingly faster, cheaper, more powerful and much smaller, TRINAMIC Motion Control announces the TMCM-3230. 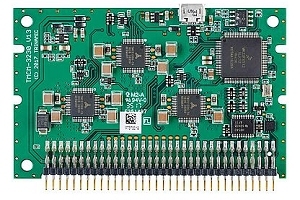 A highly miniaturized, technologically leading-edge stepper driver unit, it can be easily plugged into a customized baseboard offering a single 68-pin connector. A demand for compact, decentralized devices instead of huge machines is driving this general trend towards miniaturization. “For many manufacturers, small and decentralized devices enable leaner processes and reduce storage and logistics cost,” explains Trinamic’s CEO Michael Randt. This trend is visible in all kinds of applications such as microbiology instrumentation, lab automation, scientific test equipment and micro precision systems – which is why Trinamic developed the credit card sized plug-in module TMCM-3230. Measuring only 80mm x 50mm, the cost-efficient TMCM-3230 embeds advanced motor control functions, motion control and PLC features like all other TMCM modules. Host communication is possible using the serial UART interface (with a standard RS232 or RS485 level shifter) or using the optional CANopen (CAN controller is already integrated on the board). Together with the free and easy to use TMCML-IDE, the module allows for easy implementation of a standalone program flow and remote-controlled operation. Designed for an operating voltage of 12V to 24V DC nominal at 1A RMS phase current, the new module offers leading-edge current control technologies based on Trinamic’s latest stepper motor driver generation. A high-resolution microstepping with up to 256 equidistant microsteps per full-step generates a total resolution of 51.200 steps per rotation, resulting in vibration-free positioning. With Trinamic’s stealthChop™ current control for silent positioning at low speed and spreadCycle™ for highest performance at high speed, the module provides superior performance wherever small stepper motors are used. An integrated sixPoint™ ramp generator per axis allows for precise and rapid positioning – even in environments where parameters and target positions must be changed during motion. The module has L R reference switch inputs for every axis and comes with stallGuard2™ for sensorless homing. 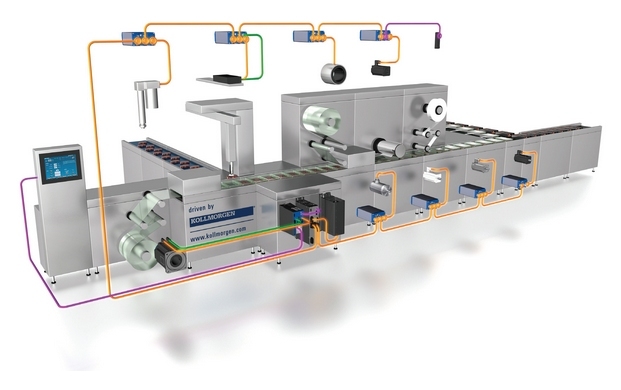 In many processing and factory automation machines, it is possible that there is a combination of methods that feed material into, and exiting from the machine, some requiring quick precise control. In other situations, specific product may require additional steps based on its particular design. Using a decentralized drive approach, the machine builder can design machinery that allows for these “optional” configurations easily. In essence, you create the ability to offer “plug and play” attachments which provides tremendous flexibility for the end users of the machinery. What about adding options in the field? No problem – again, the plug and play nature of the decentralized solution offers the machinery builder to consider new ways to sell the machine, along with field installable upgrades. Customers can purchase a lower cost machine initially, and later add on options that increase the machines capabilities (like an additional feeder, or discharge mechanism), as production demands increase. There are a variety of solutions we would consider that make up a decentralized system, including integral motor/drive combinations, as well as “near” drives mounted in the vicinity of the motor it is driving. A key advantage of the “near” drive approach, like the Kollmorgen AKD-N, is in it’s flexibility to be paired with a variety of motor solutions. So again, we hit on flexibility with regards to this kind of decentralized approach as the machine builder can better optimize the servo requirements by choosing the best servo motor solution, regardless of technology. This can be a huge advantage over integral designs as the machine builder can utilize conventional servos, direct drive rotary or linear, frameless, or other servo controlled actuator assemblies. 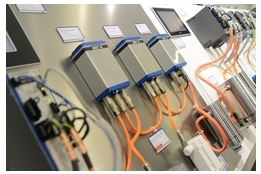 A key feature related to the Kollmorgen AKD-N product offering is the utilization of a single cable approach and EtherCat fieldbus network. This facilitates the ability to daisy chain the necessary power, feedback, and fieldbus communications from drive to drive. Adding another drive to the link is as easy as connecting the new drive into the network. Additionally, the AKD-N solution can also play well with conventional “centralized” solutions as well where a very high power axis may require a higher current drive. Decentralized solutions – lower cable costs, reduced cabinet sizes, less cooling, flexibility – all add up to a great solution for precision motion along with cost savings! Bob has been with Kollmorgen for over 30 years, serving in a variety of positions including Applications Engineering, Product Marketing, Industry Marketing, Territory Management, Systems Engineering, Training, and now Digital Marketing. In addition to being published in several magazines over the years, Bob is also credited with the creation of a famous collegiate football tradition – The Sousaphone line dance to the Hokie Pokie – performed at every Virginia Tech Football game over the past 30 years! TRINAMIC Motion Control extends its portfolio of TMCM embedded motor control modules. 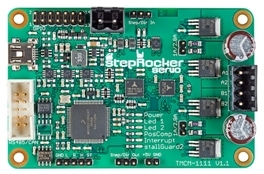 Following to the success of the TMCM-1110-StepRocker single axis board, the TMCM-1111-StepRocker-Servo is designed to be as easy to use as its sibling, but with additional closed-loop stepper motor servo functionality. The new board drives 2-phase bipolar stepper motors from 500mA to 1.0A RMS or from 1.1A to 2.8A RMS selectable by jumpers. Utilizing Trinamic’s highest performance stepper motor driver IC for external MOSFETs TMC262 and the dedicated closed-loop motion controller TMC4361, the TMCM-1111 is a cost- and energy-efficient stepper motor servo controller for stepper motors with a/b/n quadrature encoders. Ideal for liquid handling and handling sensitive goods, the S-ramp controller allows for precise and fast positioning. The TMCM-1111 can be controlled via RS485 or USB serial interfaces (CAN retro-fit option) and is designed as open source hardware – schematics and layout are available for download. A simplified code project for the NXP Kinetis microcontroller including Trinamic’s TMCL protocol can be downloaded as well. The credit card-sized board has dimensions of 85mm x 55mm. The board is available for shipment from November 2017. The benefits of connecting drives using just one cable are obvious in machinery and plant construction: they include faster installation, space savings, reduced inertia, and lower costs to name a few. Following very positive experiences with the AKD and AKD-N servo drives, KOLLMORGEN is now also equipping the talented all-rounder S700 with its pioneering single-cable connection technology. The KOLLMORGEN servo controllers from the SERVOSTAR series S700 are primarily designed to fulfill particularly complex drive tasks – with safety technology up to and including SIL3. The devices can be programmed freely with macro support in IEC 61131-3 based language. The S700’s features also include cogging compensation for excellent radial run-out characteristics. 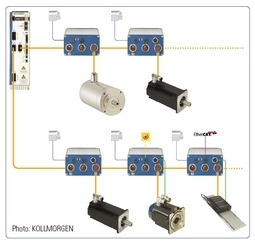 KOLLMORGEN is connecting the in-house developed digital resolver SFD or high-resolution Hiperface DSL encoder with one standard motor cable through the single-cable connection technology now available for the S700 controllers. The result is a cost-efficient and slender installation solution which reduces costs while also helping to increase machine performance – starting from space gains to more speed when positioning, as less cable needs to be moved at the same time.